Acupuncture comes from the Latin word “acus” which means needle and “punctura” which means to puncture. It is a key component of Traditional Chinese Medicine (TCM) and is a form of alternative medicine which involves the insertion of extremely tiny needles through the skin at strategic acupuncture points. Not only that, it can also be associated with electroacupuncture, moxibustion, cupping therapy, Chinese herbs and guasha. Acupuncture can be done with the application of pressure, laser light or heat to the same points. Traditional Chinese medicine views acupuncture as a technique for balancing the flow of “qi” or energy flowing through meridians or channels in our body. Eastern acupuncture practitioners believe that people get sick because there are imbalances between yin and yang and by inserting these needles, our energy flow will re-balance. On the other hand, Western practitioners view acupuncture points as places to stimulate nerves, connective tissue and muscles regulating blood flow and by this stimulation, our body’s natural painkillers will be released. Traditional acupuncture is not based on scientific research but rather on philosophy and intuition while in modern acupuncture, consultation is followed by tongue inspection and pulse taking on both arms. In Traditional Chinese Medicine, disease is usually perceived as an imbalance in energies such as yin, yang, zang-fu, qi, xue and disharmony of the interaction between our body and the environment. Therapy is based on which pattern of disharmony, for example, some diseases are believed to be caused by excess of cold, damp and wind invading the meridians. In order to determine which disharmony is at hand, four diagnostic methods are being used. First, inspection which focuses on observing the patient’s face, particularly the tongue, its shape, size, color, presence of teeth marks along the edges and tongue coating. Second is inquiry which focuses on the seven inquiries namely chills and fever; perspiration; appetite, thirst and taste; defecation and urination; pain; sleep; menses and leukorrhea. Third, auscultation and olfaction which involves listening for particular sounds such as wheezes, quality of breathing and attending to body odor. Lastly, palpation which focuses on bodily tender points or “A-shi” points and feeling of both radial pulses. Through these steps, practitioners then decide on which points to acupuncture. The number and frequency of acupuncture sessions vary, but most practitioners do not think one session is enough. Depending on the patient’s condition and response to therapy, a common treatment plan for a single complaint usually involves eight to twelve sessions to be carried out once, twice or thrice weekly over a few months. During acupuncture session, patients are either asked to sit or lie down while the skin is sterilized and a number of sterile needles are being inserted. This can be manipulated manually including flicking, spinning, moving up and down relative to the skin or can be attached to electrical stimulation (electroacupuncture), heat, laser light or moxibustion and will be left in place for thirty to forty minutes. A quick insertion of the needle is recommended to lessen the pain since most pain is felt in the superficial layers. Once the needle is inserted, patient usually feel a dull, localized, aching sensation that is called “de qi” or the arrival of qi. De-qi refers to a sensation of distension, numbness or electrical tingling at the needling site which radiate along the corresponding channel or meridian. If de qi sensation is not achieved immediately upon needle insertion, various manipulations can be applied to promote it. Once de qi is achieved, further techniques can be used to influence the de qi which aim either to tonify or sedate qi. De qi is more important in Chinese acupuncture while some Japanese or Western practitioners may not consider it a necessary part of the treatment. Acupuncture needles are usually made of stainless steel, making them flexible thus preventing them from rusting or breaking. Needle length varies, ranging from 0.51 to 5.12 inches (13 to 130mm) and diameter ranging from 0.006 to 0.018 inches (0.16 to 0.46) with shorter and finer needles used in the face and around the eyes and longer needles in areas with thicker tissues such as the thigh and buttocks. 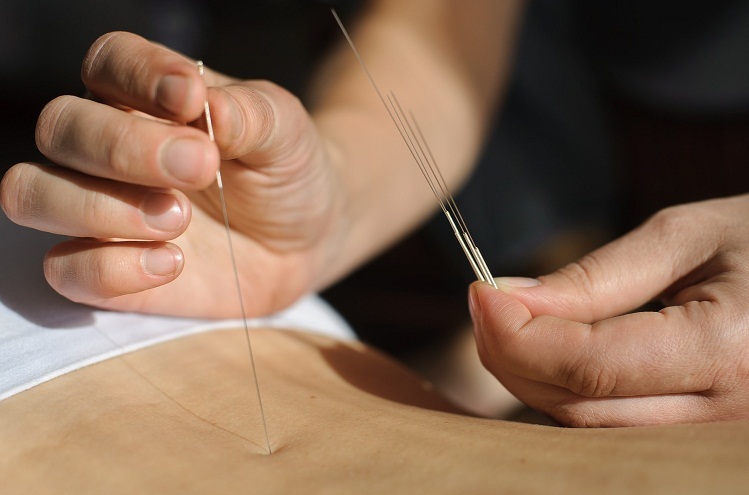 Acupuncture needles are disposed after each use to prevent contamination. The tip of the needle is usually blunt to prevent breakage, though blunt needles cause more pain. Other needles used include three-edge needles, nine ancient needles, copper needles. Generally, acupuncture is not painful. Patients usually feel numbness or heaviness where the needles are inserted and this is normal. In the hands of experienced, well trained acupuncturist, acupuncture is safe and has no side effects. Sometimes, patients get bruises but this will fade in 1-2 days with warm compress. There are generally no contraindications to acupuncture but just some reminders to keep in mind. Patients are usually advised not to take shower or cold drinks three hours after acupuncture. Pregnant and menstruating women can have acupuncture but they have to tell their acupuncturist that they are pregnant to allow your acupuncturist to avoid points that induce labor. Maintenance medications can be taken as usual. Patients can return to their usual activities after acupuncture, however, if you feel sleepy and tired after acupuncture, kindly do so. This will help you recover faster. THX that’s a great help!